Nick Hudson is Chief Executive Officer at Ormiston Academies Trust (OAT) and is passionate about driving school improvement. 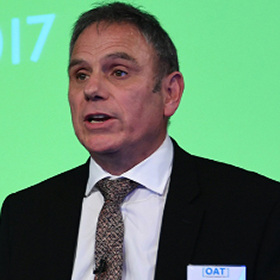 Nick joined OAT as Chief Academy Improvement Officer where he led, managed and co-ordinated the work of the OAT School Improvement team, including Regional Directors. He brought with him a wealth of experience from his previous role as Ofsted Regional Director for the North East, Yorkshire and Humber region, where he led on all Ofsted inspection work there. Nick was also previously Ofsted National Director for Early Education a member of the Ofsted Executive Board.